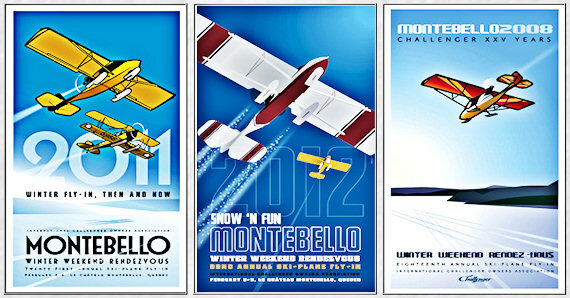 The Challenger Winter Rendezvous posters are created by Dave O'Malley of Aerographics Ottawa. Dave is also historian and webmaster at Vintage Wings. "Download Linked File", or in Internet Explorer select "Save Target As". 30 YEARS OF CHALLENGERS! = Evolution Extraordinaire! SNOW 'n FUN = A celebration of the rites of winter! WINTER FLYING - THEN & NOW! = It really wasn't better in the old days! THE BIG TWO OH! = Wow, twenty years in a row! Click either the English or French poster below and see if you can find the 49 Challengers! 100 YEARS OF ULTRALIGHTS! = 100th anniversary of the Silver Dart! TWENTY-FIVE YEARS YOUNG! = 25th anniversary of the Challenger! TWO FLIGHTS AWAY! = Go one hop farther for new sights! PASS IT ON! = Challenger community mentors newcomers! Copyright Dave O'Malley and National Ultralight Inc. All rights reserved.